Remaster specialist Nightdive Studios wants to remaster Star Wars: Dark Forces (one of the greatest shooters ever made, in my opinion). Quoting the news that EA has reportedly canceled a major Star Wars game, Nightdive founder and CEO Stephen Kick tweeted the request to Disney, and called for public support. It’s that follow-up tweet that’s got my hopes up – possibly naively, but you never know. Nightdive specialises in projects like this – it obtains the rights to abandonware, updates them for compatibility with modern platforms, and re-releases them for digital distribution. The studio first did this with System Shock 2, meaning Warren Spector – who helped make the original System Shock and is working on System Shock 3 – had to reacquire the rights from Nightdive. 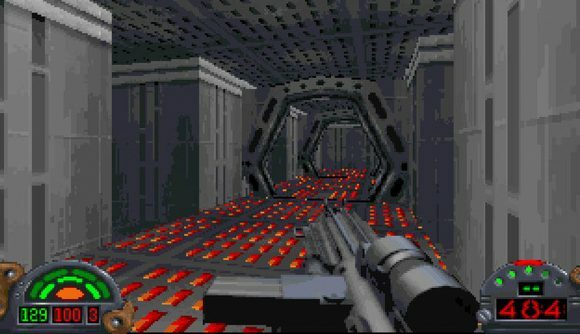 Dark Forces is perfectly playable on Steam, where you can nab it for $5.99 (£4.79), but it’s still encumbered by the technical and graphical quirks of its original 1995 release. If you’re not familiar with Dark Forces, it was released in 1995, when the industry was obsessed with imitating Doom. Yet it stood out for being one of the few shooters to truly innovate: it was first or among the first to add jumping, crouching, and looking up and down, which it exploited in vertiginous, fiendish level designs. These levels included some of the first 3D polygonal objects in a so-called ‘2.5D’ engine – an engine which Lucas Arts built from scratch, and also enabled dynamic level elements such as flowing water, low-friction surfaces (aka, ice), crushing ceilings, and conveyor belts. It used these elements to devise fiendish puzzles more than three years before Half-Life would do the same, and, in an age where most shooters had you flip a switch to exit a level, Dark Forces told a real story with cutscenes and varied, contextual mission objectives. Last but not least, it offered the player ten creative weapons with multiple firing modes and behaviours, including mines and grenades. This, while almost every other shooter on the market aimed for nothing greater than being a Doom clone.